There is no dearth of handset manufacturers in India, both Indian and global alike. However, there is one brand that stands miles ahead of its competition and is actually watching others compete without being in the race itself. This particular handset manufacturer is none other than the Micromax, who has been a silent spectator on the bylines watching other brands trying to reach the bar set by it. This Indian handset manufacturer has been churning out launch after launch throughout the year and none were lesser than the other. Through this article, we try to go over some statistics to figure out what makes this home-bred handset manufacturer stand out amidst the competition crunch. It is a known fact that higher the number of smartphones in the line-up, more is the visibility of the brand and higher is the per capita sales of handsets. Samsung has proved this fact right, time and again with its Galaxy series of handsets. However, unfortunately for the South Korean giant, it is in the bottom three when we talk about the launches in the year 2014. Micromax was miles ahead in terms of launches and brand visibility. With 8.46% of overall launches in 2014, the handset manufacturer was perched comfortably on top of the chart. It is evident that the handset manufacturer was launching at least 2-3 handsets every month, which drastically improved its reach and visibility in India. It not unknown to the handset manufacturer in India that the key to success in our country is the strategic pricing of new launches. The year 2014 saw highest number of smartphone launches in under INR 5000, INR 5001 to INR 10000 and INR 10001 to INR 15000 segments. 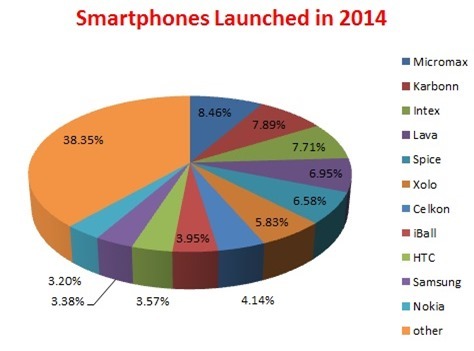 The smartphone launches in these segments were 38.11%, 37.36% and 10.94%, respectively. 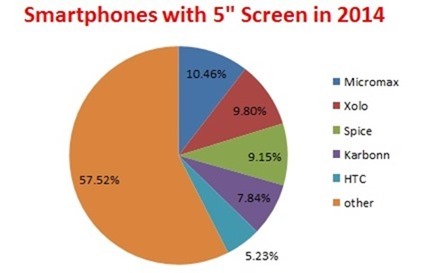 Micromax again emerges as a leader here as it launched 5.94% handsets in sub-Rs. 5000, highest 14.14% in INR 5001 – INR 10,000 and 8.62% in INR 10,001 – INR 15,000. With higher number of launches in most profitable segments, Micromax has got its strategy right. 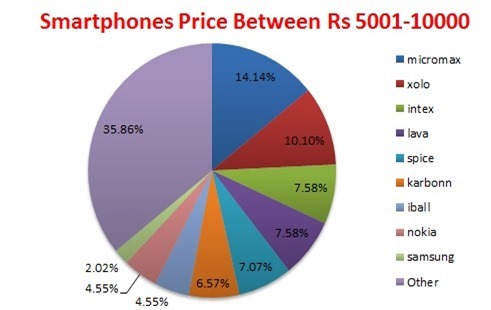 However, it is also true that pricing lower might backfire if the handset lacks adequate features. Micromax has been doling out launches that are not only affordable but also offers a good set of features in that price range. Smartphones with atleast 5-inch of display is an absolute must these days and Micromax has launched the highest, 10.46% handsets with a 5-inch display this year. Another favorite with Indian customers is the support for dual-SIM in handsets. A fact to be noted here is that Micromax was the first handset manufacturer to have inducted dual-SIM support. Being a pioneer of this technology, it is no surprise that 9.70% out of total handsets launched, were dual-SIM by Micromax. 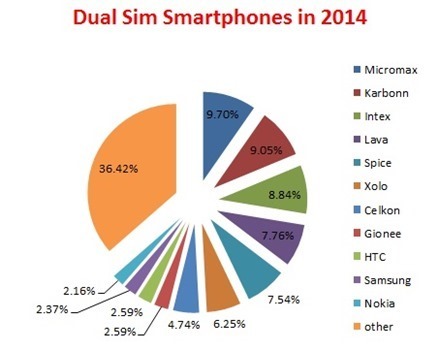 This is also the highest number of dual-SIM handsets launched by a single manufacturer in this year. Micromax was also one of the front runner in other features like Quad-core processors, camera resolution and RAM. Micromax has been able to gauge the temperament of the Indian smartphone buyer accurately and it shows in the launches being handed out by the brand. It is, therefore, no wonder that the brand has been able to topple over several big league player on its home turf and emerge as a winner. (Note – In Above report we used data provided by PriceRaja.com (formerly known as pricebag.com). Excellent review, I am sure that Micromax is able to grab a large part of the cell phone market area in India and it is growing too fast.